Carpenter's Bluff and Carpenter's Bluff Bridge of Texas and Oklahoma. Carpenter's Bluff is said to be named after a Red River ferry operator by that name. The town dates from about 1860. After the Civil War, the town was briefly known as Thiefneck after the unsavory characters that congregated there. Rather than apply for a post office under that name, the townspeople decided to clean house. 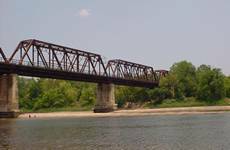 The Kansas, Oklahoma and Gulf Railway constructed the bridge, and later it became property of the Texas and Pacific Railroad. 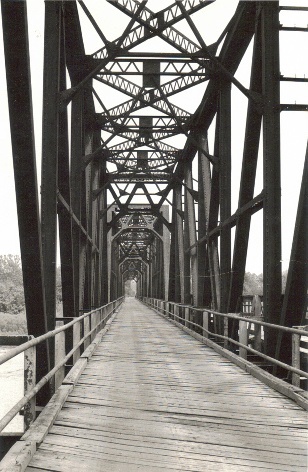 The bridge became joint property of Grayson County, Texas and Bryan County, Oklahoma in 1966. "Carpenter's Bluff (pop ca. 100) is located east of Denison on FM 120. The bridge can be found just north of the road as you enter the settlement. This impressively high bridge spans the Red River and links Grayson County to Bryan county, Oklahoma. Built in 1910, it was designed to allow trains, wagons, pedestrians, and horses to cross for a toll. 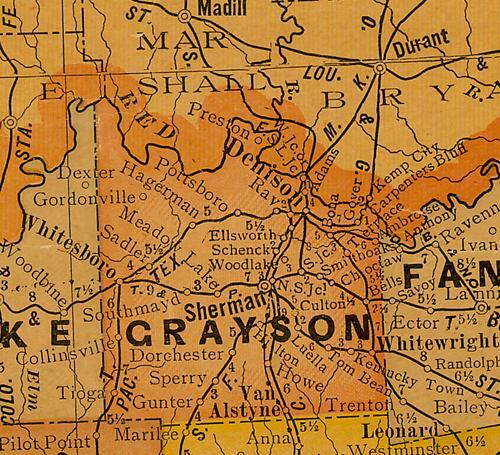 In the 1960's, the bridge was deeded to Grayson County, which renovated it for automobile use. 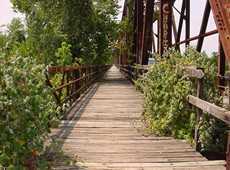 It's now a one-lane bridge with the old wooden walkway hugging it on one side."